The MPG team has been honored by the Cincinnati USA Convention and Visitors Bureau with a Spirit of Cincinnati Partnership Award for its work on a multi-media live spectacular that was presented as part of the closing ceremonies at the 2010 World Choir Games in Shaoxing, China. Titled “The American Dream,” the show introduced singers from around the world to the city of Cincinnati, which will host the World Choir Games in 2012. 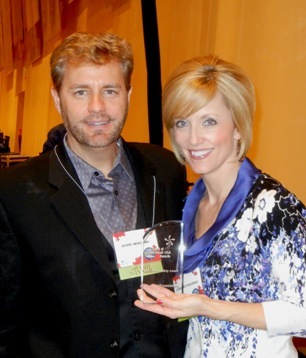 Calling the show “one of the most powerful tools we had to demonstrate the power of American music and Cincinnati USA,” the convention and visitor’s bureau gave MPG the Partnership Award at its 2011 annual meeting. “MPG created a truly memorable show, and let the world know that Cincinnati USA will be ready to take center stage in 2012,” said members of the selection committee. Written, produced, orchestrated, cast and costumed entirely by MPG, “The American Dream” featured Broadway caliber performers with video transitions that followed a young boy from China and a young girl from Cincinnati as they chatted via computer about their plans for the 2012 games. 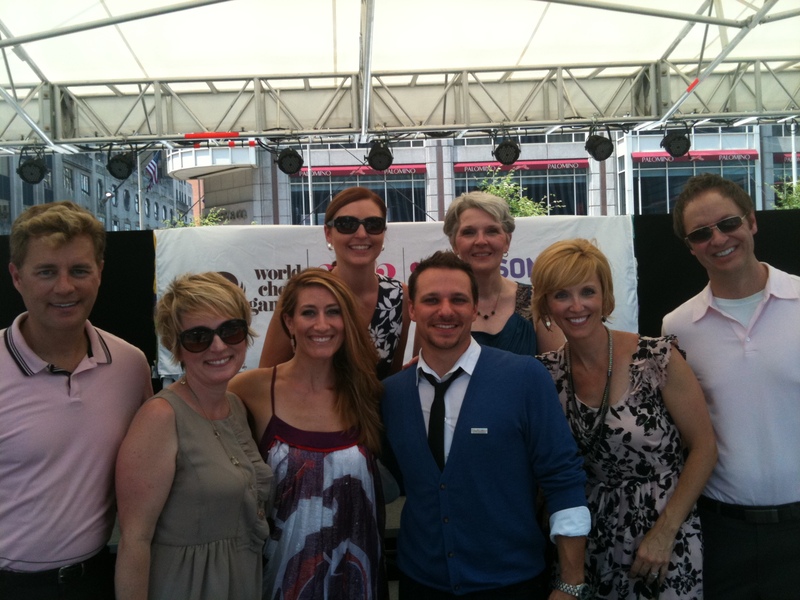 Recently the MPG team had a chance to let our city—and the world—know about an amazing event coming to Cincinnati in July 2012. It’s the World Choir Games, and we couldn’t be more excited. So we were thrilled to help create and produce a Countdown to the Games event in Cincinnati’s Fountain Square. The lunchtime celebration featured Drew Lachey as emcee, performances by Kelly King of last year’s “American Dream” show in China, an introduction to Whirl and Twirl, the 2012 Games’ official mascots, and a “musical postcard” welcome (below), which is being broadcast to the world on YouTube. Despite the record heat, we had a huge turnout for the Countdown, and everything went off without a hitch. Team MPG is so appreciative of the many volunteers and performers who helped make this event a success, and we can’t wait to help create even more memorable moments when the games arrive here at this time next year! For companies considering a new trade show booth, the time has never been better. That’s because the U.S. Government recently passed new legislation that lets businesses fully expense in 2011 the cost of capital equipment. What does this mean? Instead of depreciating the cost of a new booth over several years, companies can write off the full purchase in 2011. The result? You get most of the tax benefits of investing in new exhibits now, giving you more working capital up front. It’s all part of an effort to boost job creation and keep the economy energized. For companies that routinely appear at trade shows, it can mean making a splash with a new custom-designed booth—one that you own. It also can mean added cost savings in updated, lighter-weight exhibit structures that lower operating costs and increase flexibility. Moening Presentation Group (MPG) and our design partner, InterGlobal Exhibitions (IGE) Group, have already helped a number of brands and companies take their trade show presence to the next level with new booths that combine award-winning design with expert messaging, plus a commitment to sustainable materials and practices. You can see some examples of that work right here. The new legislation provides for full expensing of new property eligible for bonus depreciation, including exhibits, which are placed in service between Sept. 9, 2010 and Dec. 31, 2011. So the clock is ticking! Consult with your tax advisor to learn more about bonus depreciation, then call MPG to discuss how we can start designing your new booth today! They say nobody likes a pest, but when it comes to choosing a partner to create your events and trade show activations, a pest might be just what you need. What you want is a company that isn’t afraid to prod you when a deadline’s coming, let you know when a request will impact budget in a major way and stay in front of you when feedback, assets and approvals are needed to keep a project on track. A good partner knows you’re busy, and most likely you’re working on several projects at once. We’ve seen the in-boxes of some of our clients, so we respect the many, many things competing for their time and attention. We’ve learned that sometimes it takes a bit of pestering to break through the noise and get what’s necessary at critical project milestones. Because being timid can become costly. What we may gain in not bothering someone today we risk losing multiple times over when deadlines are missed, change orders come in and rush charges start piling up. A good partner’s priority should be on keeping your project running smoothly, with as few major hiccups and nasty surprises as possible. The only way to do that is to make sure everyone’s aware of where things stand from a schedule and budget standpoint, ensure that all major stakeholders sign off on key pieces before moving forward, and manage expectations every step of the way. In today’s crazy world, sometimes the only way to accomplish those things is to be a bit of a pest. So if you’re working with a company that isn’t afraid to email and call a few extra times when a project’s mission-critical, then be glad. Often, it’s the pests who turn out to be your best partners. 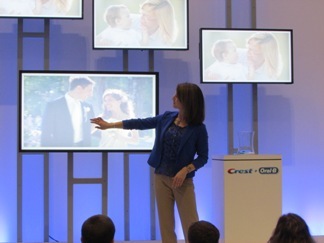 Corporate events and trade shows are one place where the messenger is just as important as the message. When competition gets fierce and setting the right tone is vital, a good presenter can make all the difference in building brand equity, establishing credibility and—most important—forging connections. When selecting talent for live presentations, it’s important to go beyond video clips, websites and resumes. At Moening Presentation Group, we always meet prospective new talent for an in-person audition and interview, so we can see for ourselves how the person will do in front of an audience and whether we’ll work well together. Are they ear prompter experts? If your presentations are tightly timed, coordinating live action with video, then you don’t want your presenters to wing it. Make sure they demonstrate proficiency with an ear prompter before you bring them on-site. Are they warm and relatable? Whether talking hard science or chatting about a consumer brand, a good presenter should be able to take a script and make it sound natural. Will they behave like professionals on- and off-stage? Your presenters are a reflection of you and your brand; you should be able to count on them to be at their best from the moment they arrive in an event city until it’s time to pack up and go home. How are they at being a team player? Are they willing to take direction and go the extra mile, helping with crowd gathering and recognizing potential hot leads? How’s their energy? The trade show floor is not for wimps. Presentations can run several times an hour and you should expect every last one to look, feel and sound like the very first. Hiring the best talent isn’t easy, especially when you consider that you’re selecting someone to represent you in front of hundreds, perhaps thousands of people. MPG has a roster of professional presenters who have proven themselves the best in the business. If you have a project that requires superior talent, get in touch with us. We’d love to put their expertise to work for you, because your message deserves nothing less! Sara Bennett Wealer, MPG Senior Writer, recently took on a new title: published author. Her first novel for young adults, RIVAL, was released Feb. 15 by HarperTeen, an imprint of HarperCollins. 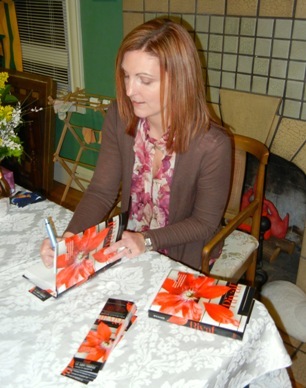 Sara held a launch party for RIVAL at the Blue Marble Bookstore in Fort Thomas, Kentucky. Speaking to an audience of friends, family, readers and book bloggers, she talked about the inspiration for the book and her journey to publication, with a bit of advice for aspiring novelists thrown in for good measure. RIVAL is on sale now. Our hearts are heavier as we head into this year’s holiday season because we do so without one of our beloved team members. Jean Carey, who most recently acted as MPG’s Finance Director but has been a dear friend and colleague for more than 20 years, passed away early this month after a brief illness. Those who knew and loved Jean have been mourning her passing but also celebrating her life. Of course, we remember the many ways she touched us personally, but we also remember how wonderful she was to work with. Jean taught us so much about professionalism and attention to detail—she was one of the best in her field, and we all benefited from her advice and expertise. We loved working with Jean, and we know she loved working with our team members. As we celebrate her contributions to MPG during this season of Thanksgiving, we also want to celebrate the other talented people who help us succeed and grow and provide the best possible service to those who entrust us with the job of putting their messages in the spotlight. Our creative team – From concepts, scripts and graphics to video, digital and décor, we live for the ideas! And we never cease to be amazed at what comes out of our brainstorms. One thing’s for sure: we’ve got some big thinkers on Team MPG. Our amazing producers – They not only execute the big ideas, they contribute a few of their own—all in the name of delivering unforgettable experiences. Our producers get the job done and make sure it exceeds expectations. They aren’t satisfied until a project is flawless. Our incredibly talented presenters – Simply put, we hire only the best, and they deliver for us—time and time again. Whether they’re singing and dancing or talking hard science with industry professionals, our people have a special ability to connect with audiences and make a real impact. Our world-class hosts and hostesses – In many ways, these team members are the face of MPG and our clients. They go the extra mile at events, troubleshooting, educating (sometimes even selling), and making sure all goes smoothly. They work with class and discretion to make sure everyone has an outstanding experience. The partners who help us shine – We know we can count on these folks to bring a little something extra—to complement our skillsets, make us look good on the show floor, and help provide our clients with the latest event marketing solutions. And finally… Our clients – They provide us with wonderful stories to tell. They push and challenge us. And they allow us the privilege of continuing to do what we love best. We’ve made some great friendships within the companies with whom we work, and we’re proud that we can continue to give them our very best. Thanks to everyone who helps makes MPG a special team to work with. We value you more than we could ever express! In today’s world of 24/7 connectivity, a company’s trade show activities no longer represent one-time opportunities to deliver messages and make contacts. Now, more than ever, they offer the chance to build relationships that can last long after the convention has ended. Incorporating digital tools into your trade show strategies can add a whole new dimension by engaging members of your target audience in an ongoing conversation. MPG has been doing this with some of our key clients, helping them get more out of their convention investments by reaching out to prime prospects before the event, enhancing the attendees’ experiences at the venue, and then continuing to connect with those attendees long afterward. Using a combination of personalized direct mail and digital marketing, we draw attendees online where they can register for special VIP events, enter for the chance to win prizes onsite, and opt-in for future communications. Often, these opportunities are tied to attendees providing simple data that helps our clients get to know and serve them better in the long run. Traditional pre-show email and direct mail response rates hover around 1-2%, but with personalization, response rates can go up to 10%. Trade show attendees tell us the personalized outreach, VIP booth treatment and meaningful interaction after the convention make them feel special. And your company can enjoy a treasure trove of data you can use to build relationships and increase sales, seamlessly. These days events take place in many dimensions at once, and the connections that happen there can be rich and long-lasting. We’re excited to be using the latest tools to help enable those connections and can’t wait to see where they’ll take us next. For more information on how we can help you integrate personalized digital marketing into your next event, visit our website, www.moeningpresentations.com. Well, it’s all coming together now. The cast of our “American Dream” American music showcase is in Cincinnati, and we’re getting ready to take the show to China! Our eight singers and dancers have been learning music and dance steps for the past week, and we’re so impressed with the energy and heart that they bring to this project. Although we’ve only known them for a few days, this cast already feels like family. During the audition process each was chosen not just for his or her talent, but for personality, warmth and excitement. While in China they’ll be representing Cincinnati and the U.S. to choirs and spectators from 70 countries, and we know they’ll do us proud! And then… we’re off to Shaoxing, where we’ll perform for participants in the 2010 games, giving them a taste of what’s to come when they visit Cincinnati in 2012. Want to know more about the World Choir Games in Cincinnati? Here are the basics! WHAT: The World Choir Games (WCG), the largest choral competition in the world, takes place every two years and is the signature event of INTERKULTUR, a Germany-based organization that produces international choral events. Inspired by the Olympic ideal, the goal of the WCG is to unite people from all nations through singing in peaceful competition. WHEN: The 2012 World Choir Games will occur July 4-14, 2012. WHERE: Cincinnati, Ohio, USA. This will be the first time the event is held in North America. Host 400 choirs from more than 70 countries. Bring together 20,000 participants, including performers, staff, delegations and international jury members. Deliver up to 200,000 spectators at the WCG events. DETAILS: There will be 22 different musical genres evaluated by an impartial international jury. Categories include: barbershop (for the first time in the WCG history), folklore, jazz, pop, gospel, spiritual and more. Cincinnati USA was selected over 20 cities to host the 2012 World Choir Games. This will be the largest and most significant international arts event ever in the history of Cincinnati USA. With an estimated 45,000 contracted room nights, this is the largest hotel booking ever by the Cincinnati USA Convention & Visitors Bureau. The event is expected to generate $73.5 million in economic impact. Hundreds of “Friendship Concerts,” free, public performances by WCG choirs, will take place throughout Cincinnati USA. What’s New With MPG at the WCG? We can’t believe how fast the year has gone! In a little more than a month we’ll be presenting our American Music Showcase, titled “The American Dream: A Musical Journey,” in Shaoxing, China. To meet the young stars of our show, check out this new update at our website. And for more updates on this exciting project, check out our special World Choir Games news page!